Race, diversity, and inclusion have dominated the national news for several months with the “Black Lives Matter” movement in response to the wave of recent high profile cases of police brutality. More recently, various demonstrations and protests at college campuses around the country have been held regarding issues of race, diversity, and inclusion at these institutions. AMP aims to continue to be a powerful voice speaking for underrepresented minority students, medical trainees, and faculty while aiming to maximize diversity and inclusion in our own institutions. Dorothy Charles, second year medical student at the PSOM, has been a champion of this endeavor. 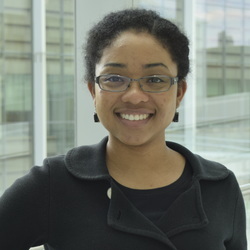 Ms. Charles is a founding organizer of WhiteCoats4BlackLives (WC4BL), a national medical student organization devoted to embodying the responsibility of the institution of medicine to counteract systemic and interpersonal racism and its effects on the practice of medicine and the health of patients. How did you first get involved with WC4BL? I got involved with WC4BL and medical student activism last year during the white coat die-ins in December. There were a group of people in my class who wanted to figure out the role of physicians and medical students in addressing larger issues of structural racism, especially instances of police brutality. At the time, protests were going on nationwide regarding the murder of Mike Brown, Eric Garner, and others, and we wanted to create a medical student response since most medical institutions and physicians were quiet on the issue. How has your involvement with WC4BL shaped your experience and goals in medical school? My involvement with WC4BL has sparked my interest in working to advance racial justice, specifically in medicine. Medicine has its own institutionalized racism to deal with, from the way we educate students like me, to the way racist ideas get embedded into medical practice, to the way we deliver (or don't deliver care) to communities of color. Knowing that there are many ways to pursue racial justice in medicine motivates me to stay involved in this work post-medical school. Any words of wisdom to share so far in your medical training? In my short time in medical school thus far, one of the most valuable lessons I'm learning is to pursue what's most motivating for you, even if it's "unconventional."